Mohammadi, Hesaneh, Gheitanchi, Mohammadreza. (1394). Rupture characteristics of the 2012 earthquake doublet in Ahar-Varzagan region using the Empirical Green Function method. مجله ژئوفیزیک ایران, 9(5), 81-92. Hesaneh Mohammadi; Mohammadreza Gheitanchi. "Rupture characteristics of the 2012 earthquake doublet in Ahar-Varzagan region using the Empirical Green Function method". 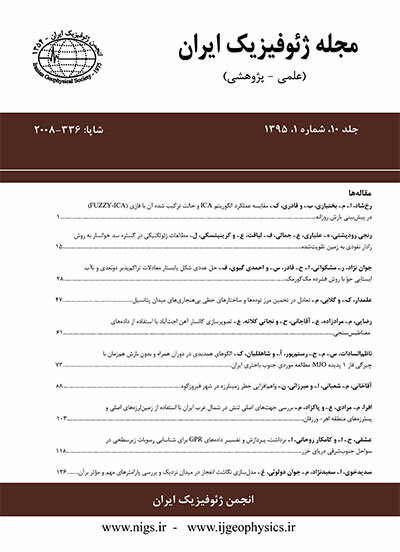 مجله ژئوفیزیک ایران, 9, 5, 1394, 81-92. Mohammadi, Hesaneh, Gheitanchi, Mohammadreza. (1394). 'Rupture characteristics of the 2012 earthquake doublet in Ahar-Varzagan region using the Empirical Green Function method', مجله ژئوفیزیک ایران, 9(5), pp. 81-92. Mohammadi, Hesaneh, Gheitanchi, Mohammadreza. Rupture characteristics of the 2012 earthquake doublet in Ahar-Varzagan region using the Empirical Green Function method. مجله ژئوفیزیک ایران, 1394; 9(5): 81-92. On August 11, 2012,within several minutes, two shallow destructive earthquakes with moment magnitudes of 6.5 and 6.4 occurred in Varzagan, Azerbaijan-e-Sharghi Province, in the northwest of Iran In this study, the Empirical Green Function (EGF) method was used for strong ground motion simulationto estimate the source parameters and rupture characteristics of the earthquakes. To simulate the first earthquake, two aftershocks with magnitudes of 5.6 and 5.2 were used as the EGFs. In the second event, an aftershock with a magnitude of 5 was used as the small event. The size of the main fault caused by the first event was about 18 km in length and 10 km in width. Also, the size of the asperity in the second earthquake was about 16 km in the strike direction and 11 km in the dip direction. The durations of the ruptures in the first and second events were more than 9 and 10s, respectively. The estimated fault plane solution showed strike-slip faulting for the first earthquake and a reverse mechanism with a strike-slip component for the second one. Strike, dip and rake of a causative fault of the first and second earthquakes were determined as 270, 81 and 175 degrees and 230, 57 and 134 degrees, respectively. In addition, the stress drop in the first and second events was calculated to be about 22 and 34 bar, respectively. On August 11, 2012,within several minutes, two shallow destructive earthquakes with moment magnitudes of 6.5 and 6.4 occurred in Varzagan, Azerbaijan-e-Sharghi Province, in the northwest of Iran In this study, the Empirical Green Function (EGF) method was used for strong ground motion simulationto estimate the source parameters and rupture characteristics of the earthquakes. To simulate the first earthquake, two aftershocks with magnitudes of 5.6 and 5.2 were used as the EGFs. In the second event, an aftershock with a magnitude of 5 was used as the small event. The size of the main fault caused by the first event was about 18Â km in length and 10 km in width. Also, the size of the asperity in the second earthquake was about 16Â km in the strike direction and 11 km in the dip direction. The durations of the ruptures in the first and second events were more than 9 and 10s, respectively. The estimated fault plane solution showed strike-slip faulting for the first earthquake and a reverse mechanism with a strike-slip component for the second one. Strike, dip and rake of a causative fault of the first and second earthquakes were determined as 270, 81 and 175 degrees and 230, 57 and 134 degrees, respectively. In addition, the stress drop in the first and second events was calculated to be about 22 and 34 bar, respectively. Astiz, L., and Kanamori, H., 1984, An earthquake doublet in Ometepec, Guerrero, Mexico: Phys. Earth PlanetInterior, 34, 24–45. Cheng, F., and Huang, H., 2011, Strong ground motion simulation of the October 22, 1999 Chiay earthquake using hybrid Green function method: 4th IASPEI international symposium, University of California, Santa Barbara. Courboulex, F., Virieux, J., Deschamps, A., Gilbert, D., And Zoll, A., 1996, Source investigation of a small event using empirical Green functions and simulated annealing: Geophys. J. Int., 125, 768–780. Eshelby, J. D., 1957, The determination of the elastic field of an ellipsoidal inclusion, and related problems: Proc. Roy. Soc., A241, 376–396. Hartzel, S. H., 1978, Earthquake aftershocks as Green functions: Geophys. Res. Lett., 5, 1–4. Hutchings, L. and Viegas, G., 2012, Application of Empirical Green Functions in earthquake source, wave propagation and strong ground motion studies: Lawrence Berkeley National Laboratory, USA, 3, 80–130. Irikura, K., 1991, The physical basis of the empirical Green function method and the prediction of strong ground motion for large earthquake: Proc. International workshop of seismology and earthq. Eng., 89–95. Kagan, Y. Y., and Jackson, D. D., 1991, Long-term earthquake clustering: Geophys. J. Int., 104,117–133. Lay, T., and Kanamori, H., 1980, Earthquake doublets in the Solomon Islands: Phys. Earth Planet. Interior., 21, 283–304. Lin, C. H., Yeh, Y. H., Ando, M., Cheng, T. M, and Pu, H. C, 2008, Earthquake doublet sequences: Evidence of static triggering in the strong convergent zones of Taiwan: Terrestrial Atmospheric and Oceanic Sciences, 19, 589–594. Miyake, H., Iwata, T, and Irikura, K., 2000, Source characterization of inland crustal earthquakes for nearsource ground motions: Proceedings of the 6th international conference on seismic zonation. Mueller, C., 1985, Source pulse enhancement by deconvolution of an empirical Green function: Geophys. Res. Lett., 12, 33–36. Raghu, S. T. G., 2008, Modeling and synthesis of strong ground motion: Department of Civil Engineering, Indian Institute of Technology, Madras, India. Wells, D. and Coppersmith, K., 1994, New empirical relationships among magnitude, rupture length, rupture width, rupture area and surface displacement: Bulletin of the Seismological Society of America, 8, 974–1002.